Although the primary focus of keto is to restrict carbs and eat plenty of fat, protein intake also plays a crucial part in your success. By eating too much protein, you may impair ketone production. However, keeping protein consumption low is not ideal either. So, how much protein should you eat on the keto diet? Moreover, will eating more than your recommended amount be bad for ketosis? To answer these questions, let’s take a closer look at protein consumption and how it affects your keto diet success. Protein digestion and assimilation are such intricate processes that we are only going to explore the main pieces that pertain to ketosis and keto dieting in this article. More specifically, we will be focusing on our hormonal response to protein intake. When protein is digested, it will trigger the release of two energy-regulating hormones: insulin and glucagon. The degree to which each hormone is released depends on many factors including the macronutrient makeup of the person’s diet, their gender, their activity levels, and if they have diabetes. Insulin stimulates the uptake of sugar into cells, sugar burning, and anabolic processes like glycogen storage and protein synthesis (think muscle growth), while also reducing lipolysis (the breakdown and release of fat from fat cells) and gluconeogenesis (a metabolic process that turns non-sugar compounds into sugar). Glucagon triggers glycogen breakdown, lipolysis, fat burning, and gluconeogenesis. For keto dieters, the most striking effect these hormones have is that they have opposing influences on ketone production. Insulin decreases ketone production while glucagon stimulates it. The ratio of insulin to glucagon is one of the main factors that determines how your protein intake will affect your ketone levels. For example, if you secrete much more insulin than glucagon in response to a protein feeding, then ketone production will be reduced. On the other hand, when more glucagon is released, ketone production will be stimulated. In general, you can think of insulin as an energy-storage hormone that helps keep blood sugar (and other energy sources like ketones and fatty acids) from getting too high and glucagon as a hormone that stimulates energy production that keeps blood sugar and overall energy levels from getting too low. The ratio of insulin to glucagon plays a crucial role in which hormone takes precedence (e.g., if insulin levels are higher, ketone production will — in most cases — be reduced, but when glucagon is consistently higher, ketosis will follow). Protein consumption will typically cause both insulin and glucagon to increase. As a result, insulin levels may elevate to the point that you are “kicked” out of ketosis. The likelihood of this happening, however, depends on specific aspects of your health and how much protein you consume. Studies indicate that type 2 diabetics are much more likely to experience a significant increase in insulin levels after protein intake, while healthy individuals may not experience any insulin increase at all. This means that people who are struggling to keep their blood sugar levels under control may end up impairing their ketone production or preventing their bodies from entering ketosis by eating too much protein. On the other hand, healthier individuals, especially if they are active, will be able to consume much more protein without it kicking them out of ketosis. In other words, the impact that protein intake has on your ketone levels may depend mostly on the degree to which your cells are insulin resistant or insulin sensitive. This is purely speculation at this point, but it seems that the more insulin sensitive you are, the less likely your insulin levels will increase significantly in response to protein consumption and reduce your ketone levels. Conversely, if your cells are more insulin resistant (e.g., if you have type 2 diabetes), then protein will stimulate more of an insulin response, decreasing your ketone production. The concept of insulin resistance and insulin sensitivity is relatively complicated in itself, so if you want to learn more about what this means for you, I recommend checking out our article on insulin sensitivity. Another more recent study indicates that gender plays a role in how much glucagon and insulin is secreted after protein consumption as well. The results of the study suggest that healthy women in their early 20s experience a similar insulin increase after protein ingestion compared to men of the same age, but glucagon secretion is significantly lower in women than in men. It is also important to note that the women participated in the study while they were in their follicular phase, which is characterized by changes in hormonal response and food intake. The researchers speculate that, if the study were done during their luteal phase, then the women would have a more similar hormonal response (i.e., glucagon and insulin secretion) to the men. The same may also be true for postmenopausal women. These findings indicate that women may experience changes in how their protein intake impacts their ketone levels depending on where they are in their cycle. During their luteal phase, for example, women may be able to eat more protein without it impacting their ketone levels, but once they are in their follicular phase, that same amount of protein intake may trigger a decrease in ketone production. Now that we understand some of the critical concepts behind why protein consumption is so controversial for keto dieters, let’s dispel a common myth before we take our conceptual findings to a practical level. The main argument against eating more protein is that your body will turn it into sugar and that sugar increase will cause insulin to increase, fat to be stored, and ketone production to be halted. In other words, you must keep your protein low on keto or else you will be wasting your time. However, researchers have found that only a tiny percentage of protein consumed will enter the circulation after being converted into sugar. In fact, the current data indicate that blood glucose levels do not increase after protein ingestion in subjects with and without diabetes. Researchers speculate that most of the sugar produced from the protein will be used to replenish glycogen stores or released over an extended period of time in small increments. In other words, eating high amounts of protein will not affect blood sugar levels in the way that many keto proponents believe they will. Thus, your protein intake will only be detrimental to your keto diet if it increases insulin levels to the point that ketone production reduced. Whether or not this will happen depends on a variety of factors that we will take a look at in the next section. How Much Protein Should You Eat on the Keto Diet? Genetics. Genetic expression can impact the degree of insulin resistance and sensitivity throughout your body as well as your ability to burn ketones for fuel. Both will affect your hormonal response to protein consumption. Gender. As we discovered earlier, women may have a different response to protein depending on what phase of their cycle they are in. Current macronutrient and calorie intake. In general, eating fewer carbs and/or calories can keep higher protein intake from reducing your ketone levels. How long you have been on keto. Restricting carbs will help decrease insulin levels and increase your ability to produce and burn ketones. The longer you are on the keto diet, the less likely a higher protein intake will disrupt ketosis. Activity levels. If you are more active (especially if you lift weights), you will need more protein to restore your glycogen levels and build muscle. You will also require less insulin to make use of that protein. This means that ketone production will continue to be stimulated, even after high protein meals. Current body composition. The heavier you are, the more protein you will need to eat. If you have a higher body fat %, higher protein intakes may cause enough of an increase in insulin levels to decrease ketone production. Body composition goals. Ideally, you want to eat enough protein so that you maintain/gain muscle mass without it decreasing ketone levels. Each one of these variables will affect how much insulin and glucagon you secrete in response to protein consumption. This will then determine how much that protein affects your ketone production and other processes in the body (e.g., muscle protein synthesis). If you are sedentary — consume 0.6 – 0.8g of protein per pound of lean body mass. If you are regularly active — have 0.8 – 1.0g of protein per pound of lean body mass. If you lift weights — eat 1.0 – 1.2g of protein per pound of lean body mass. Alternatively, if you want to have this calculation (and all other macro calculations) done for you, use our keto calculator. However, using either one of these methods will not tell you your maximum keto protein limit. If you want to push the boundaries of your protein intake to see how much you can eat without affecting your ketosis levels, you will need to use a more complex strategy. Buy a blood-ketone meter with test strips. Eat less than 35 grams of carbs a day for a week, following the protein intake recommendations that you get from the previous section or our keto calculator. Then, test your ketones first thing in the morning before eating anything. If your blood-ketone levels are at 1.5 mmol/L or above (this is considered as optimal for keto dieters), increase your protein intake gradually (i.e., have an extra serving or two of high-protein foods per day) over the next week. Measure your blood-ketone levels every morning and see what happens. How many grams of protein can you eat per day before your ketone levels drop below 1.5 mmol/L? Eat a little less protein than that. by little until your ketone levels are in the optimal range. Keep measuring your ketones for a few days, and if you’re always in optimal ketosis, you have found your ketosis protein limit. Measure your ketones just once a week after that to make sure you are still on the right track. As you can see, this process is pretty intricate and requires a great deal of awareness and experimentation. However, you may be wondering if all of this focus on keto diet protein limits is really worth it — especially after finding out that keeping your protein intake low is all you need to do to prevent this macronutrient from impairing ketone production. Although it is true that limiting your protein consumption can help increase ketone production, this doesn’t mean that you should eat as little protein as possible. In fact, if you don’t eat enough protein (i.e., staying within your recommended protein range), it’ll be much more difficult to get the results you want. Getting the right amount of protein every day is crucial to your keto diet success. When protein consumption is too low, following any diet plan will be so much more challenging. This is because protein helps increase calorie burning while also decreasing our cravings and hunger levels. On top of that, protein helps us maintain/build muscle mass, which not only makes us look better but improves our quality of life in many ways as well. Altogether, these benefits will help enhance your weight loss results while making it much easier for you to stick to the keto diet for the long term. As soon as you figure out how to reap these benefits (by using our keto calculator and/or experimenting with different protein intake levels), you will be ready for the next step: meeting your daily protein needs. The best way to do this? By adding more keto-friendly protein sources to your diet. Whole Eggs. Try to get them pasture-raised from the local market if possible. You can prepare them in any way you’d like. Ground beef, steak, roasts, and stew meat. Stick with fattier cuts and 100% grass-fed when possible. Poultry. Chicken, duck, quail, turkey, pheasant and other wild poultry. Offal/Organ. Heart, liver, kidney, and tongue. Offal is one of the best sources of vitamins, antioxidants, and minerals. Other Meat. Veal, goat, lamb, and other wild game. Stick with fattier cuts when possible. Nut Butter. Go for natural, unsweetened nuts and try to stick with fattier versions like almond butter and macadamia nut butter. Legumes (peanuts) and almonds are high in omega 6’s so be careful about over-consumption. Cheese. Cheddar, mozzarella, parmesan, and other hard cheeses. Always purchase full-fat cheeses. Keto-Friendly Protein. 100% grass-fed whey protein, collagen protein, casein protein, pea protein isolate, and any other very low-carb protein powders. For those of you who are trying to cut down on any animal products, please check out our guide to vegan keto dieting. There you’ll find plenty of vegan-friendly protein sources. To meet your needs with these protein sources, I recommend researching their nutrition info online or on a calorie tracking app and splitting your servings evenly throughout your meals. However, if you are weight training or doing any form of rigorous exercise, feel free to have your highest protein meal post-workout to make it easier to meet your protein needs without it impacting your ketone levels. For those of you who want more precise protein intake recommendations, the simplest option is using our keto calculator. From there, feel free to experiment with higher protein intakes while measuring your blood ketone levels if you’d like to find out what your personal keto protein limit. However, don’t forget to apply what you learned in the context of a well-formulated keto diet. All of this information is useless unless you are sticking with your diet plan. 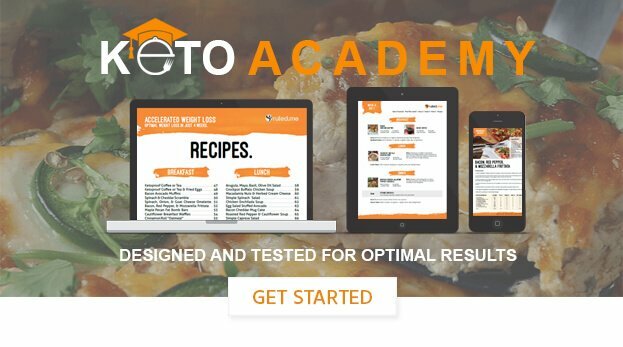 To help you get started with your keto lifestyle, I suggest checking out our comprehensive guide to the keto diet. In it, you will find all the info you need to get started.